I have so many memories of this movie. I used to watch it all the time. I adore the atmosphere of the house, and really, my favorite parts of the movie are when Mary is exploring Mistlethwaite. Plus, Dickon. Seriously, I could watch this movie all day. It’s eerie at times, and truly magical at others. My favorite parts are still when Mary is running around the house, exploring. And the music is GORGEOUS. Raise your hand if you too had a crush on Dickon. Don’t lie, we all know you did. I bust out laughing when he first appears on screen, because he’s on this white horse, looking all romantic interesty, and then you’re like, oh wait, he’s like, twelve. Can we please fast forward about five years and see how they’re doing? This whole cast is so great. Kate Maberly is adorable as Mary, playing quite the sullen brat at the beginning and growing into a lovely girl by the end. I love how her costumes go with her character journey, starting out in black (“Black, black, or, black!” “Are you blind? They’re all black!”) and then moving into more bright colors, like the adorable blue striped dress in the above gif. And then there’s Dickon (Andrew Knott) who is a great contrast to the sickly Colin (Heydon Prowse), and both boys are entertaining and of course we have DICKON AND MARY OTP FOREVAAAAAAA. Colin is annoying brat. It’s no surprise that Mary likes Dickon more than him (aside from the fact that Mary and Colin are cousins). The whole movie, there’s this weird underlying love triangle (ok, maybe not LOVE) between Mary, Dickon and Colin, and Colin is always jealous of Mary and Dickon’s relationship (GET OVER IT DUDE THEY’RE MEANT TO BE). Plus he throws fits and is just generally annoying. Although Mary works her magic and makes him a better person by the end, I still don’t like him all that much. Maybe it’s just because compared to Dickon, he’s super lame. I mean, come on, Dickon can talk to animals. Anyway, you’ve also got Maggie Smith as Mrs. Medlock, who is the stern house keeper though ultimately she shows her heart of gold. Plus the girl who plays Martha, Dickon’s older sister is adorable and adds some nice comedic relief, especially in the gloomy beginning. 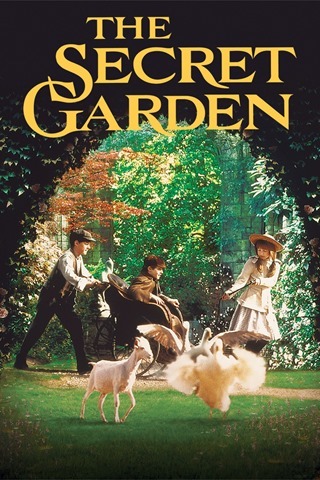 Just an all around solid cast, with GORGEOUS everything: Music, costumes, sets, gardens….it’s truly a magical movie that I could watch over and over again. If you’ve never seen it, you should check it out. It is guaranteed to bring a smile to your face. This entry was posted in Film Friday, Movie Reviews. I still have never seen the end of this movie!! We watched it once at my aunt’s (recorded on VHS off tv), and she was notorious for often missing the end of movies. But given this review I feel I should go back now and get a refresher. I don’t remember anything of it except the cover picture…and maybe a scene in a long hall. Nothing of said secret garden.